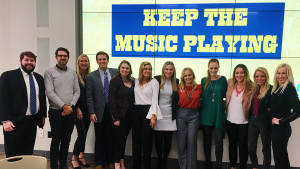 All semester long, advertising and public relations students in the APR campaigns class (APR 433) completed projects for pitching to the Country Music Association (CMA). Students took their final project to Nashville to propose their final integrated communication campaigns. The class, which all seniors in APR take, integrates the public relations and advertising students in order to provide a well-rounded project culture during the course. Professors selected CMA as the client that the students work for all semester. C&IS departments work hard to ensure students receive real industry experience before graduating. The student experience is marked by connections with professionals during their undergraduate years. Students traveled with professors to CMA headquarters in Nashville to provide a realistic pitch experience. They presented their projects to marketing and communication executives at CMA. The students got a special surprise when Garth Brooks, CMA Hall of Fame and singer-songwriter, popped in to tell them hello during their pitches. Instructors for the course include Dr. Kenon Brown, Randall Huffaker and Teri Henley.